A new update for Flipboard aims to make the popular reading app more personal—but not all the time. Flipboard 3.0 lets users add new magazines on more than 30,000 topics, from broad ones like “art” and “food” to highly specific ones like “optical illusions” and “human geography.” When launching the app, Flipboard presents a massive list of potential topics to select, along with a search bar for finding exactly what you want. As before, Flipboard sources its stories from around the Web and presents them in a magazine-like format. For those who don’t want to drill down into specific topics, Flipboard is also adding a staff-curated “Daily Edition,” with general topics like news, business, tech, sports and culture. A new edition will arrive every day at 7 a.m., and it will always conclude with a “Parting GIF.” Of course, users can still follow individual publications or users who’ve curated their own magazines, and they’ll show up alongside new topics in Flipboard’s typical grid view. The update also includes a redesign for smartphones, geared toward jumping into the news quickly. A new Home button replaces the tablet version’s “Cover Stories,” and mixes together stories from various topics. From the grid view section, you’ll find subsections for people, topics and social media accounts. The new design also includes buttons for search, notifications and profile, and the entire app has been visually revamped with new typography and full-screen covers. Flipboard 3.0 is available now for iOS and Android. There’s no word on when the Windows Phone and Windows Store versions will get the update. 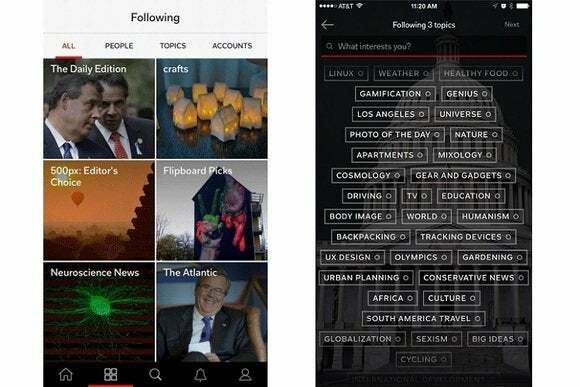 The story behind the story: Flipboard says it’s using the technology it acquired from Zite to help power the new topics. Flipboard has more visual flair, and it received more media attention after its splashy iPad launch in 2010. Zite always felt a little faster for getting to the news you actually cared about, though. Zite remains available today, but it’s no longer being developed, so it’s good to see Flipboard putting the technology to work.